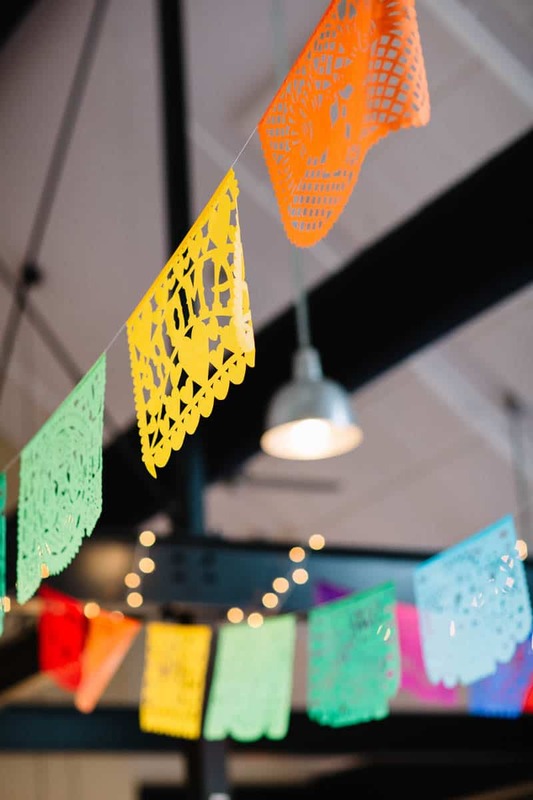 THIS MEXICAN THEMED WEDDING IN A BREWERY IS A GENIUS IDEA! Julia and Jared had always known that they wanted to have a clambake, if like me you have know idea what that is, it’s a traditional method of cooking clams and other seafood, it’s fun to share with friends and is an event that shouldn’t be missed. “Ideally we wanted a ‘backyard wedding’ (though no one was offering up their backyard).We actually discovered the brewery from our caterer in talking through our vision. The waterfront setting and ‘aggressively laid back’ mantra of the brewery set the tone for the day.” Julia told us. “The color inspiration really came from the bright colors of the food. We knew the tables would be filled with bright red (lobster) and yellow (corn on the cob) so we played off that, leaving white tablecloths as the blank canvas. The papel picado idea came from a favorite Mexican restaurant we used to frequent near Jared’s college campus. We BOTH love hot pink, and found ways to sprinkle it in without feeling overwhelming. My sister handmade the ‘J&J’ pinatas for us and some of my extremely talented friends from design school flawlessly executed the day-of decor.” Julia Explained. And we couldn’t leave without asking Jared about their first look… Those images honestly brought tears to our eyes!